Wanna hear a cool story? a vendor at the Art for the Cash Poor fair in Northern Liberties asked me as I walked by. Sure! Two friends in a bar are talking about what kind of animals they would be were they to have animal form. One said a wolf because he's fierce; the other, a pig because he's big. Beer spilled on the bar counter and when they looked down at the suds they saw a wolf and a pig. "Wolfpig!" they exclaimed. The brother of the guy who identifies as a wolf is an art teacher and he knew they wanted to go into some kind of business with the "WolfPig" theme. 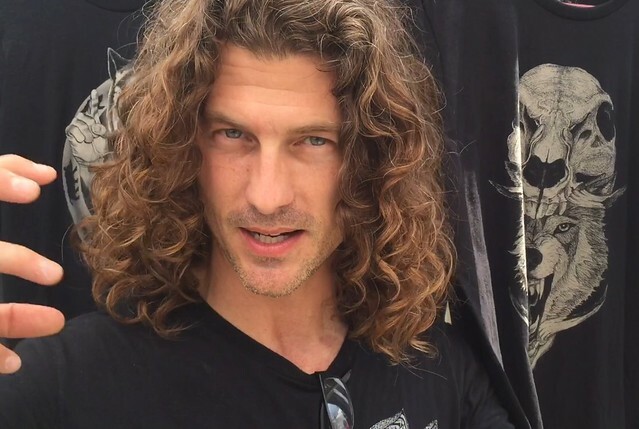 Along with another art teacher friend they settled on a t-shirt business because "wearable art" is an economical and effective way of making their art accessible to the public. At the fair they were selling exquisitely drawn t-shirts which they had made on a fine mesh screen using a process called discharge. The technique selectively removes the color from the black and grey t/shirts and bandannas they use. Themes draw on Aztec, Hindu and other mythologies and employ the wolf and pig motif, indicative of the yin and yang balance of nature and life. On some shirts the pig is more simply a commentary on the piggishness of the current administration. "Based on the premise that everyone can be an art collector, AftCP is one of the longest running art festivals in the Kensington/Fishtown area. The best part: all works, by both emerging and established artists alike, are priced at $199 and under." 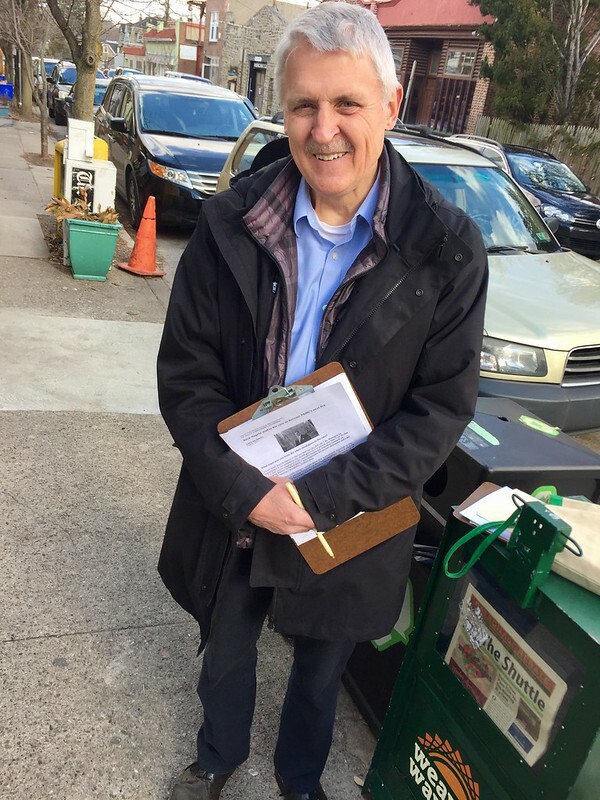 John Kromer, Philadelphia Housing Director under former Mayor Ed Rendell is out gathering signatures on petitions in support of Rich Negrin, City Managing Director under former Mayor Nutter, for Philadelphia District Attorney. Kromer, who ran for Philadelphia Sherrif in 2011 on the platform of abolishing the office, personally attests to Negrin's integrity and is confident Negrin would not support local law enforcement cooperation with ongoing U.S. Immigration and Customs and Enforcement (ICE) roundups of illegal aliens absent warrants for their arrest. Watch video here. 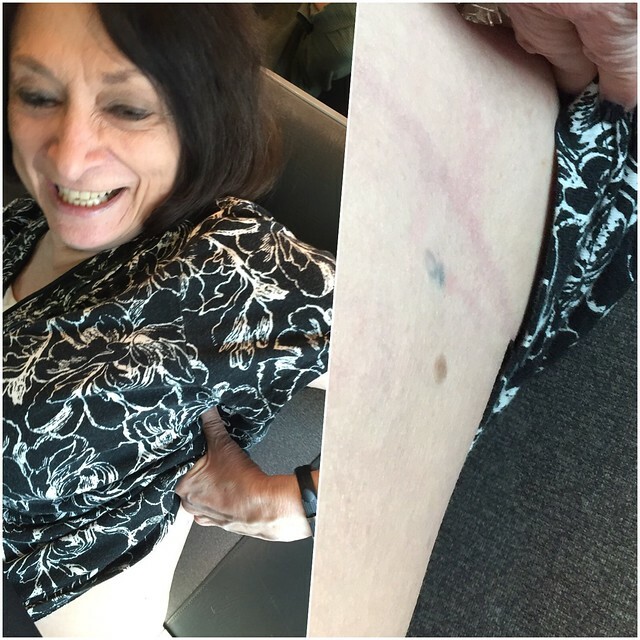 During the Cold War, as a high school freshman Eileen Levenson and her classmates were marched into the nurse's office and without explanation had their blood drawn and the next week their blood type tattooed on their side torso. She later learned that the tattoo, now an interesting conversation piece and handy reminder that she's O positive, was part of a government program also conducted upon military servicemen in preparation for a possible Russian invasion. Watch video here. Over lunch, I engaged David Komar of Phoenixville, Pa on why he's a loyal supporter of Republican candidate Donald Trump for President of the United States. "[He's] a successful man, knows a lot of people around the world. I think he's been a good sparring partner with the candidates he's had so far to date and I think that says it all." Komar went on to deflect criticism of the candidate and added that we shouldn't hate Trump because he's got billions of dollars. "Like him because maybe that would spread." Watch video here. 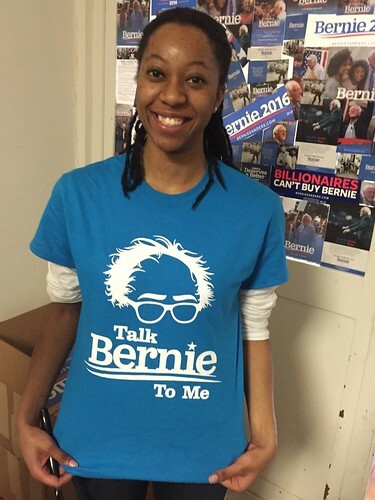 Bernie Sanders has his ardent supporters, too. An 88 year old supporters Bernie Sanders based on his free college plan and opposition to the Iraq war. Watch video here. And a young African American woman sings "Speak Dirty Bernie to Me." Watch video here. Your correspondent interviewed candidates and poll workers at the Grace Epiphany Church polling site in the Mount Airy section of Philadelphia, home to 3 voting divisions. Video playlist here. Juvenile Court Master now Judicial candidate Betsy Wahl has the support of some kids who she has helped straighten out their lives after landing in juvenile delinquency court. 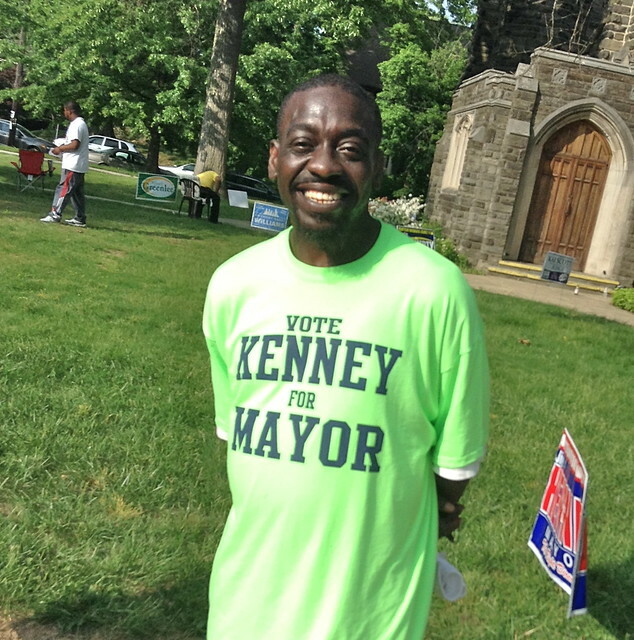 Eric Dickerson earned $100 for working the polls in three separate locations for successfuly Democratic primary Mayoral candidate Jim Kenney. Dickerson, who spent 22 years in jail lives in a recovery house and through research, which he learned to do in prison, believes Kenney is supportive of recovery houses to address the city's drug problem. Kenney faces an insignificant challenge from Republican Melissa Bailey in the fall general elections. 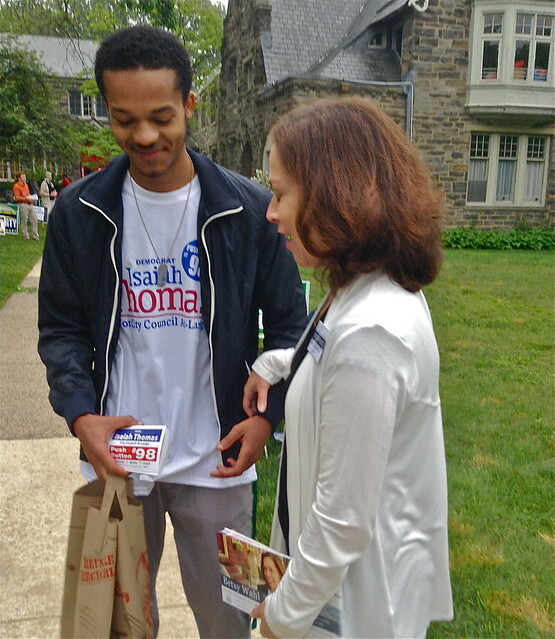 In the Mount Airy section of Philadelphia on primary election day, Tuesday, May 19, 2015, campaign pollworkers, who appear to outnumber those who have come to vote, make pitches for their candidates and hand out palm cards. Candidates are running for Philadelphia Mayor, Philadelphia City Council and Judges on Pennsylvania trial courts and the Pennsylvania Supreme Court. Watch video here. Candidate for Philadelphia Mayor in Democratic primary criticizes outside money in election. May 19, 2015. Watch video here. 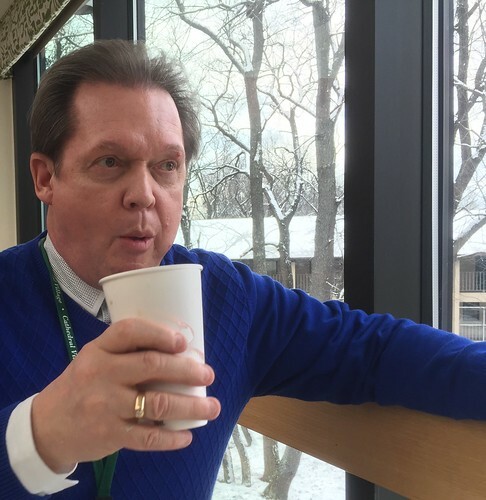 Suspended lawyer will likely soon hold Court. Watch video here. Dee Servance was canvassing door-to-door on a bitter cold winter night to raise support for a paid sick leave bill in Philadelphia. As it is now, low paid workers who get sick have to miss out on needed pay or come in to work sick, neither of which is good for anyone. The bill is before Philadelphia City Council and now that members are up for re-election, Servance’s organization, Working Families, which has worked on getting the minimum wage raised and on Pennsylvania Governor-elect Tom Wolf’s successful campaign, is urging citizens to call city council members who have not yet come on board, to support the bill. The bill would require employers with 10 or more employees to allow employees to accrue one hour of sick leave for every 40 hours worked. Watch video here.